Rafael Henrique Vareto won the Best Master’s Thesis Award on the Workshop of Theses and Dissertations (WTD) of the 31st Conference on Graphics, Patterns and Images, SIBGRAPI 2018. Currently a Ph.D. student, the Sense member presented his research “Face Recognition Based on a Collection of Binary Classifiers”, defended last year. Started on October 29 and ended yesterday, SIBGRAPI is the main conference on computer vision and graphics in South America. Face recognition is widely adopted as a biometric technology due to its contactless and non-invasive process. In his work, Vareto addresses open-set face identification, one of the most challenging face recognition settings, in which the method cannot assume that all subjects are known. Open-set face identification has to handle several unseen individuals and determine whether a given face image is associated with a subject registered in a gallery of known individuals or not. In his method, Vareto merged hashing functions and classification methods to determine when probe samples are known, i.e. included in the gallery set. The experiments were performed with partial least squares, support vector machines and neural networks to show how the vote-list histograms tend to behave for known and unknown individuals whenever we test a probe sample. “The breakthrough of the approach lies on our hypothesis about how response histograms behave under specific scenarios”, says Vareto, “and that certain patterns concerning a response histogram may be used to determine if a subject was previously enrolled in the staff or on a watch list”. The proposed method is simple and has achieved promising results in experiments conducted on the challenging datasets FRGCv1, PubFig83 and VGGFace. Currently a Ph.D. student, Rafael Henrique Vareto holds a degree in Computer Science from the Federal University of Ouro Preto (UFOP), during which he also attended the University of Strathclyde, Scotland. He also holds a Master’s degree in Computer Science from the Federal University of Minas Gerais (UFMG). This was Vareto’s third participation in SIBGRAPI and his second full work published in the event. His main research areas are researches Computer Vision, Image Processing, Machine Learning and Operational Research. 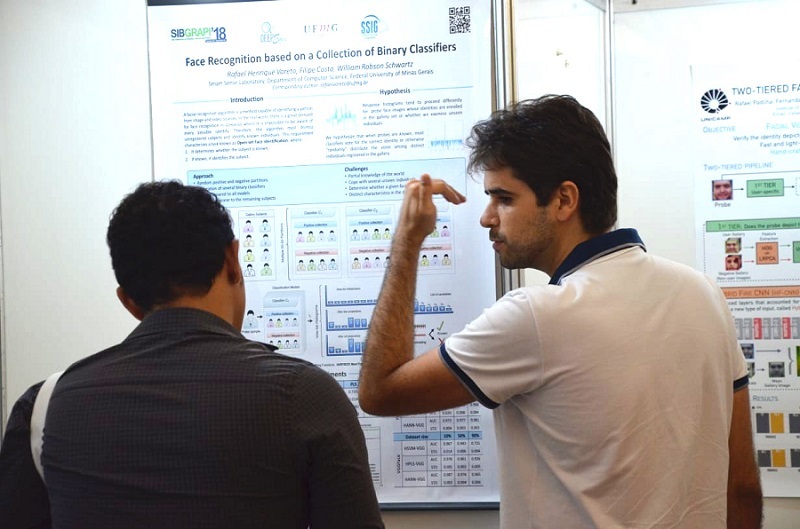 During his research, Vareto had contributions from Filipe de Oliveira Costa, from the Image and Speech Processing Management of the Center for Research and Development in Telecommunications (CPqD) and Samira Santos da Silva, a former Master’s student at Sense. Professor William Robson Schwartz, coordinator of the Smart Sense Laboratory, advised Vareto’s research. The Conference on Graphics, Patterns and Images is a leading annual conference combining contributions from four major subjects related to image computing: computer graphics & vision, pattern recognition and image processing. The proceedings have been published by IEEE Xplore since 1997. This year SIBGRAPI was co-located with two other major events: SBGames 2018, the Symposium on Computer Games and Digital Entertainment, and SVR 2018, the Symposium on Virtual and Augmented Reality.